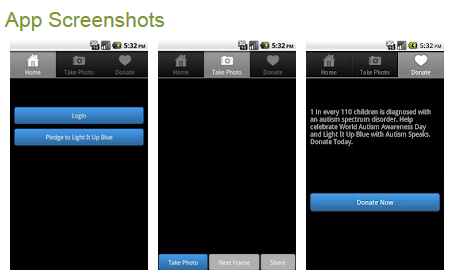 ← April 2, World Autism Awareness Day – Apps Reduced ! You will see picture of blue lights shining on building all over the world celebrating National Autism Awareness Day! Here is the free Light It Up Blue App – for iOS devices. Here is a link to the free Android Light It Up Blue app in support of National Autism Awareness Day. So support Autism Awareness Day 2012, show your blue lights, wear blue or take a picture, color it blue and post it to Light it Up Blue, sponsored by Autism Speaks! This entry was posted in App Reviews, Autism. Bookmark the permalink. Thx for letting us know about this app! Certainly! Pass the word – April is Autism Awareness Month!